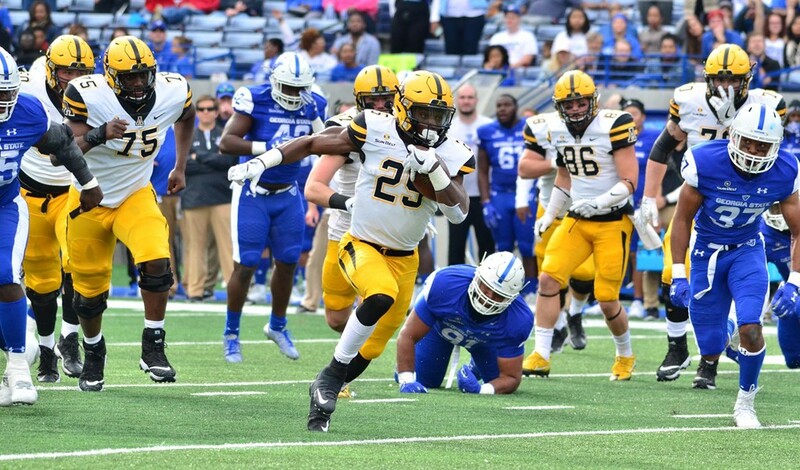 ATLANTA – Appalachian State was rested and motivated on Saturday afternoon at the former Turner Field and it showed as the Mountaineers torched Georgia State 31-10 in a Sun Belt Conference first-place showdown. Coming off a 17-day break since its 27-6 home victory over arch-rival Georgia Southern on Nov. 9, ASU overcame a few shaky moments in the first half to overwhelm the Panthers in the first matchup between Mountain coach Scott Satterfield and his Panther counterpart Shawn Elliott, who rose from Appalachian walk-ons to star players, team captains and assistant coaches before starting their careers as head coaches of the two Sun Belt squads. The Mountaineers (7-4 overall, 6-1 in conference) can clinch at least a share of their second straight Sun Belt championship by defeating Louisiana-Lafayette next Saturday at in App State’s final home game of the season. Satterfield’s job was made much easier by the resurgence of tailback Jalin Moore, the 2016 SBC offensive player of the year, who had been slowed most of the year by a series of nagging leg injuries. There was nothing slow about Moore on this showdown Saturday as he sliced and diced the GSU defense for 109 yards and a three-yard scoring burst on 17 carries in the first half alone. He finished with a workmanlike 32 carries for 239 yards. Moore’s 58-yard scamper on ASU’s first drive of the second half set up quarterback Taylor Lamb’s six-yard scoring strike to tight end Collin Reed to give the Mountaineers a more comfortable 17-7 advantage. On the initial Georgia State possession of the third quarter, linebacker Anthony Florie hit Panther QB Connor Manning full speed on a blitz and Manning’s pass fluttered into the hands of Mountaineer strong safety A.J. Howard at the ASU 34. Some 61 yards later, Howard had Appalachian in position for another score at the GSU five. Lamb’s second TD pass, this one from four yards out to Ike Lewis, all but put the game out of Georgia State’s reach at 24-7, particularly with the performance of the Appalachian defense. The Panthers (6-4, 5-2) couldn’t crack the ASU defense until Brandon Wright converted his 50-yard field goal with 4:46 remaining in the game to trim the lead to 24-10, but Appalachian countered with a 10-play, 75-yard drive. On fourth and one from the GSU 14, Lamb executed the perfect bootleg and stormed into the end zone untouched to account for the final score. It was a bitterly disappointing conclusion for Elliott, who has quickly rebuilt the struggling Panther program in his first season at the helm and only the eighth year in the team’s history. Both Satterfield and Elliott tried to downplay the sentimental side of this rivalry. Satterfield said he doesn’t enjoy meeting friends on the scene of battle, but knows it is inevitable.